The Mighty Ducks flew together once again over the weekend. Yes, the cast from the classic 1992 flick The Mighty Ducks (and its D2: The Mighty Ducks sequel) had a little bit of a reunion on the ice at Long Island's Islanders Iceworks before the New York team took on the Anaheim Mighty Ducks yesterday evening (January 20). 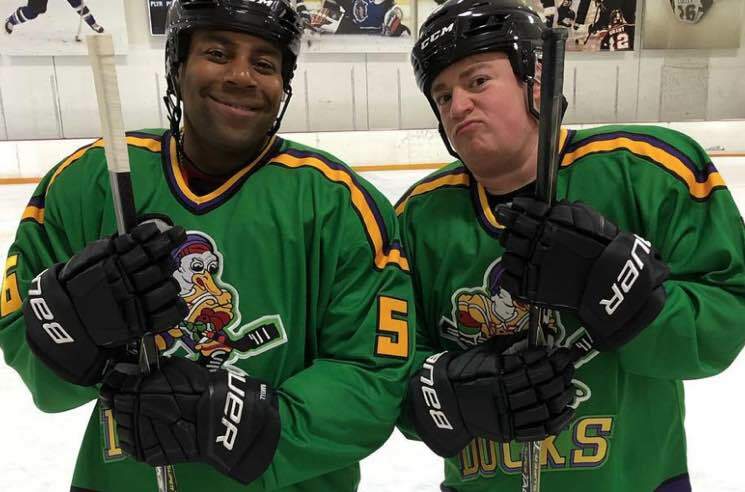 Danny Tamberelli, who played Tommy in the original film, shared a series of photos that saw him and castmates like Kenan Thompson, Colombe Jacobsen, Vincent LaRusso and Garette Ratliff Henson reunite in full '90s Ducks garb. There were even a few video clips of the actors skating around on the ice, passing the puck back and forth amid filming equipment. It's unclear what's in the works — a reboot, a Super Bowl commercial or something else entirely — but hopefully we'll get more details soon. After the shoot, the gang were gifted personalized modern Anaheim jerseys and watched the Islanders vs. Mighty Ducks game from a box. Some mighty great people joined us at today's game! Check out some footage of the mini-reunion below via Tamberelli's Instagram page.